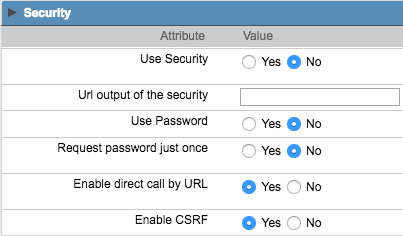 This is a feature used to increase the level of security in the form. It requires direct user interaction, through the entry of a random sequence of characters, displayed on a dynamically generated image. CAPTCHA means "Completely Automated Public Turing test to tell Computers and Humans Apart". Use CAPTCHA - Enable CAPTCHA in the application. Quantity - Number of characters displayed in the automatically generated image. List - Characters to be used in the generated image. 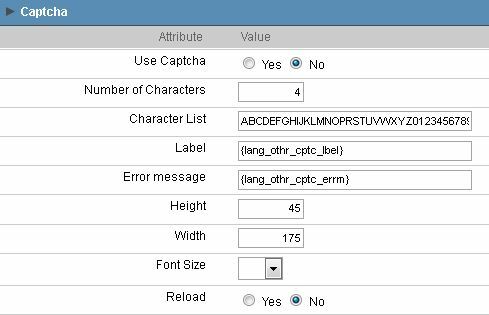 Label - Message containing instructions on how to use the CAPTCHA feature. Error message - Error message displayed when the user input does not match the generated image. Height - Height of the generated image in pixels. Width - Width of the generated image in pixels. Reload - Option for the user to request a new code. 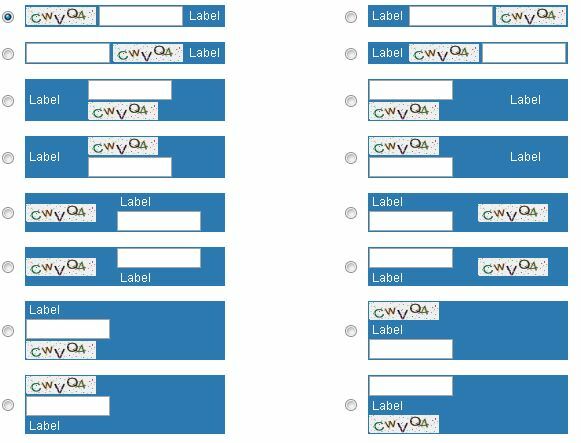 Select one layout - This option allows the developer to set how the CAPTCHA should be displayed in the application.